The temperature is rising and Larnaka is showing its summer 'face' as it transforms into a haven of sun, sand, sea, relaxation and entertainment. Aside from the usual swimming and sunbathing on the pristine Blue Flag beaches, you can also enjoy watching volleyball tournaments, attending music festivals, kitesurfing or diving. 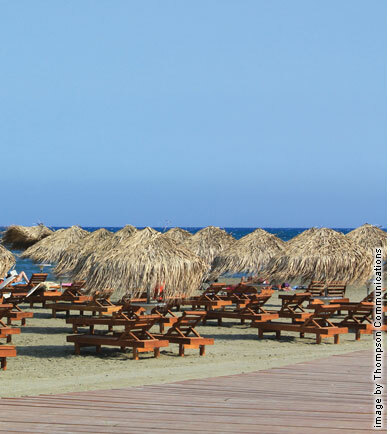 Larnaka also celebrates World Tourism Day with a number of fun events and special offers, including cooking on the beach with celebrity chef Tonia Buxton. So, whether you like to bask in the sun or escape from it, the sunny region of Larnaka will ensure that you enjoy the perfect summer! Larnaka - and the Cyprus Volleyball Federation - will host the biggest beach volleyball event ever held on the island when the FIVB Beach Volleyball SWATCH Youth World Championships come to the popular Finikoudes promenade in July. The tournament is one of the top beach volleyball events in the world and a total of 32 teams per gender from 61 countries will participate in the main draw. The contracts have now been signed for the complete renovation of the Piyale Pasha coastal road with work scheduled to begin in July for a duration of 18 months. The improvement works will see the first part of the strip transformed into a square with pavements on either side, a lower level pedestrian walkway, a strip of greenery, a bicycle lane along the seafront and new lighting. Summertime in Larnaka just isn't complete without music and this year two very different music events will be held, each with its own unique audience! The Summerland Festival is two days (August 10-11) of electronic dance music played by 23 different DJs from Cyprus and abroad. The second event is the Kindermusik European Conference on July 4–6 and it is the world's leading music and movement programme for young children. Diving is a popular pursuit on the island thanks to clear seas, warm waters and the absence of plankton, which allows greater visibility. In fact, Cyprus enjoys one of the longest diving seasons in the Mediterranean, and Larnaka offers some of the best dive sites on the island including one that even ranks in the top 10 worldwide. Larnaka's dive sites include the Zenobia, the HMS Cricket, the Alexandria and the Livia. Extreme sport fans will be pleased to hear that Larnaka has its first designated beach for organised kitesurfing at Softades, run by LKC, the first and only registered Kitesurfing Club on the island. Kitesurfing is an adventure surface water sport involving riding on water with a board strapped to the feet and a kite. The western area of Larnaka provides the perfect wind and wave conditions so that the sport can be practised all-year-round. Larnaka's Flamingos Become TV Stars! Larnaka's pink flamingo friends have become known worldwide thanks to documentary makers Ran Levy-Yamamori and Ronen Vaturi and their piece 'Documentary of the Nature of Larnaka'. National Geographic is featuring the one-minute clip that focuses specifically on the flamingos as a filler on its television channel. The clip was also shown at the Birds Festival held in Jaffa Port, Tel Aviv. If you are looking for somewhere to escape the heat, or want to learn more about the Cypriot culture, the Larnaka village of Kato Drys has a comprehensive museum dedicated to the old way of life and traditional industries and pastimes. This four-room complex in a 300-year-old house features many aspects of the villagers' daily lives. The museum exhibits over 1000 items including old farming and household equipment and furniture. Larnaka will be celebrating World Tourism Day on September 27 with a host of events that will really mark the occasion in style! For this year's event Larnaka will be offering free entrance to select museums, free city walking tours complete with a professional guide, free dancing lessons on the beach and a cooking session on the beach with celebrity chef Tonia Buxton. 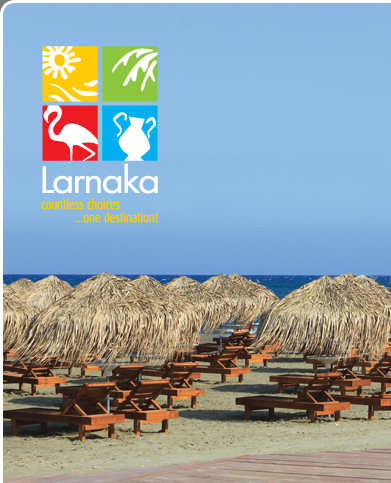 The Larnaka Tourism Board is pleased to announce that its website is now available in Russian in addition to the original English version. Cyprus has always been a popular holiday destination for Russians and with this new feature, the Larnaka Tourism Board is opening up access to its information to even more visitors and friends of Larnaka with the promise that further languages will be added in the future. Copyright © 2012 Larnaka. All rights reserved.